Hey look! Cursive has family nao! Cursive Virtue is the bottom, Chuck is the right, and left is Lillian Lovelace. Took me approximately 2 mornings, 3 afternoons, and 4-5 nights. All done in Prisma Color pencils, Faber-Castell Artist pens, and the good ol' lead pencils. Notes: I'm not sure why, but Chuck's eyes are more greenish then they should be... On the paper it's blue, but after the scan they turned blue-sea green... Probably because I messed them up, just like I did with Lilly's. Just some cool information, instead of using whatever Chuck's color is... I decided to mix gold and silver! Although it doesn't show in the JPEG (obviously), it shines and sparkles on the actual. Chuck be a rare griffon! People better get your Pokeballs ready. 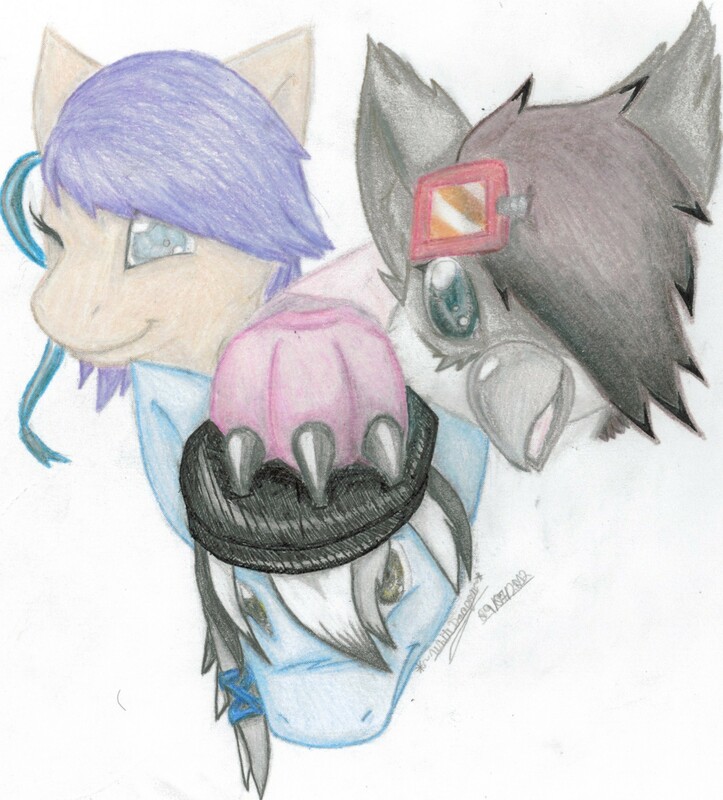 The two major things I'm proud of in this picture is the detail on Cursive's hat and how wonderfully blended Lilly's mane is, making a nice shine too. Lilly, I swear, I had the HARDEST time getting your color right... I don't have the 'tan' color in my Prisma color pencil arsenal, so I had to improvise... Since Prisma pencils blend super easy and beautifully, mixing colors for things like Chuck's rust-brown plus blackish turned out super nicely... Guess how many colors it took to get the color 'tan'? Peach, Goldenrod, Rose Pink, Terra Cotta, Dark Brown, Warm Grey, and White... Insane, huh? This is really cool! I love what you did with Chuck, especially the eyes. Page generated in 9.573 miliseconds. 17 Queries.